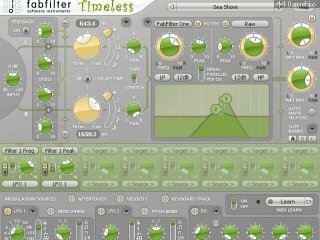 FabFilter Timeless is a stereo tape delay plug-in with flexible feedback routing, optional time stretching, two high-quality filters and our unique drag-and-drop modulation system. In FabFilter Pro-Q, the Output level parameter that is displayed in the bottom bar now includes an additional decimal of precision. Fixed a bug in FabFilter Pro-Q that caused the "Pre" frequency analyzer to use slightly incorrect input values in Mid/side mode (so it would not totally overlap the Post curve). 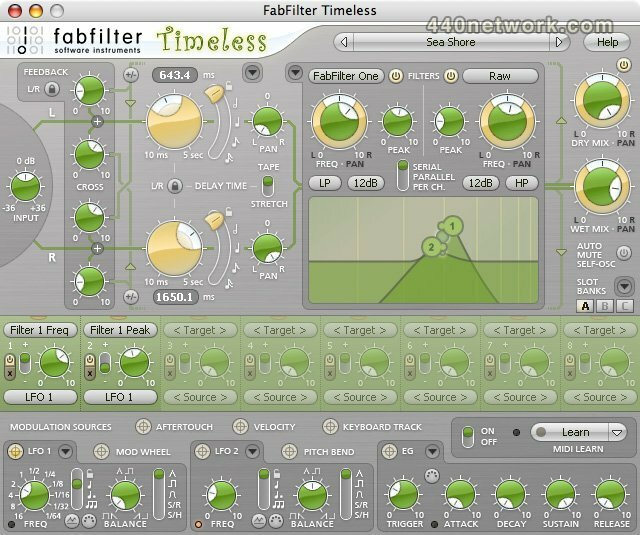 Fixed possible crashes or an empty interface in FabFilter Pro-DS with some graphics cards on both Windows and OS X. Fixed compatibility issues with WaveLab 6 in FabFilter Pro-DS and Saturn. Fixed a bug in the mono AU and mono VST 3 plug-ins that could cause it to work with an internal sample rate of 44.1 kHz even if the session sample rate was different. Fixed a bug in the resizable VST 2 plug-ins that could cause the interface to open with an incorrect size upon loading a saved session in e.g. Ableton Live. Fixed a bug on Windows that caused factory preset installation to fail if your user name contains special characters. In addition to the RTAS format, the plug-in is now also available in the AudioSuite format for Pro Tools. Fixed a bug that could cause XLFOs to run out of sync after a while. Fixed incorrect redrawing in the plug-in interface that could occur in some cases in Pro Tools on Mac, for example when selecting from the Pro Tools-provided presets menu in the plug-in header. We have just released general updates for all FabFilter plug-ins, containing bug fixes and small improvements. They are now available as a free download on all platforms: Windows and Mac OS X, 32-bit and 64-bit. We have released native 64-bit versions of all FabFilter plug-ins for both Windows and Mac OS X. The entire FabFilter plug-in range, consisting of the Pro-Q equalizer, Pro-C compressor, Timeless 2 delay, Twin 2 and One synthesizers, and the Volcano 2, Simplon and Micro filter plug-ins, is now available in both 32-bit and 64-bit editions, supporting the following plug-in formats: VST, VST 3, Audio Units, and RTAS (32-bit only). Added RTAS plugin version for Pro Tools. Improved plugin performance and fixed occasional CPU spikes on multi-core systems. Implemented reset behavior in Audio Units and VST plugins correctly. One of the most easy to use modulation matrix in plug-in-dom. Very smooth and versatile delays I have tried. Great stuff.